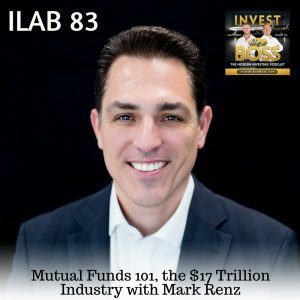 Mark Renz is a financial adviser and a sales representative for over two decades and has utilized his expertise in serving as an investment adviser for high-net-worth families since 2001. He is currently the Chief Investment Officer for an independent multi-family office, Socius, which provides honest guidance and shrewd management to preserve, protect, and build their clients’ estate. This episode explains the basics and fundamentals of mutual funds. Mark defines what a mutual fund is and other mutual funds that we might not be aware of. He teaches some strategies on how to beat the market, how to manage funds, and how to achieve greater returns. Listen in and learn more about this investment platform. Listen to ILAB 83 on iTunes here or subscribe on your favorite podcast app. 07:37 – What is a family office? 10:21 – What are Mutual Funds? 13:57 – How large is the mutual fund market? 26:15 – Dimensional Funds: Who & What they are? 31:36 – Who can invest in dimensional funds?